Amb. 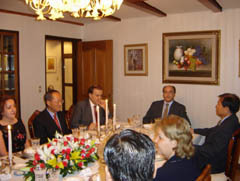 Ahmed Boutache of Algeria (second from right) hosts a dinner on July 29 at his official residence in Seongbuk-dong for the visiting President Mohamed Meziane of Algeria's energy giant Sonatrach. A new LNG tanker with loading capacity of 138,000 cubic meters of gas, ordered by Sonatrach of Algeria and Norwegian shipowner "Bergesen" was christened as "Berge-Arzew" in ceremonies held at Daewoo shipyard on July 28. The LNG carrier will be used jointly by the Norwegian partner and Sonatrach's subsidiary "Hyproc Shipping Company" to meet the growing gas exports needs of Algeria which hopes to increase its gas exports to 85 billion cubic meters by the year 2010. Attending the launching ceremony of the LPG carrier were representatives from Sonatrach and Bergesen as well as Daewoo shipyard responsible for the construction of the LNG tanker. In his speech made at the launching ceremonies, Mohamed Meziane, president of Sonatrach said that a joint project for LNG transport between two groups, BERGESEN and Sonatrach with its subsidiary Hyproc Shipping will give the two partners a solid basis for a unique cooperation in the strategic sector of liquefied natural gas transport. "We have learned how to acknowledge their capabilities and technological expertise which our partner BERGESEN and ourselves are pleased to confirm with the construction of the BERGE ARZEW and all the remarkable efforts made by Daewoo shipyards which have been up to their reputation," he said pointing out that "we are all here today to celebrate with ceremony not only the naming of a new ship but also the achievement of a joint project for LNG transport between two groups, BERGESEN and Sonatas with its subsidiary Hyproc Shipping." He congratulated all the teams who have directly or indirectly contributed to the completion of this deal, in compliance with all the partners requests. Extending his sincere thanks to Daewoo shipyard for having abided by the delivery scheduling of the BERGE ARZEW, in spite of the dramatic conditions generated by the typhoon which has devastated the region during the mooring of the ship, Meziane went on to say that he has total confidence in the professionalism and expertise of BERGESEN Sonatrach, over the last years, has developed new ambitions by increasing its natural gas and liquids export volumes with an international significant presence in all the segments of the hydrocarbons chain, upstream, downstream, transportation and optimization. Sonatrach, particularly through its subsidiary Hyproc Shipping, has a large capital of expertise and experience in hydrocarbons shipping over the world. "Standing out to sea, the BERGE ARZEW will, no doubt. meet our shared expectations, while opening up new horizons for the newly born cooperation with our Norwegian friends which could, why not, extend to other sectors such as training of sailing personnel or ship management," he added. From left to right are SK Vice President John Y. Song, Amb. 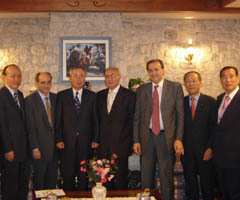 Boutache, Doonsan President Kim Dae-Joong, President M. Meziane, Vice President Ali Hached, Daewoo Vice President Kim Chang-Rae, Hanseo Univ. President Ham Kee-Sun. Mr. Meziane flew into Seoul on July 28 along with Mr. Ali Hached, vice president of Sonatrach for the christening ceremony. 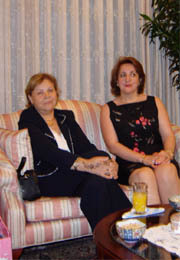 Later on July 29, Mr. Meziane was a guest of honor at a dinner hosted by Algerian Amb. 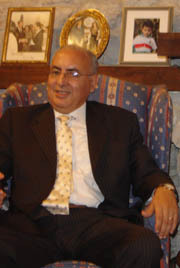 Ahmed Boutache at his official residence in Seoul. Among those who attended the function included Kim Chang-rae, executive vice president of Daewoo International, Kim Dae-joong, president of Doosan Heavy Industries and Construction, John Y. Song, vice president of SK Engineering and Construction and Ham Kee-sun, president of Hanseo University. Meziane disclosed that companies including Statoil, BHP Billiton, Woodside have been selected as winners of oil and gas exploration and production projects to be undertaken in eight blocks in Algeria during an international bidding closed on July 28 in Algeria. The blocks awarded were in the Oued Mya, Gourara, Benoud, Illizi and the oil-rich Berkine basins. Fourteen companies bid in the international licensing round. Total investment in the eight blocks is forecast at around $130 million, he said. "The fact that eight blocks out of ten were selected shows the interest of the oil companies in Algeria and the work we're doing here," he said. Algeria can meet a target to boost production to 1.38 million barrels a day by the end of the year and 1.5 million by 2005. Algeria currently produces around 1.3 million b/d, he said. Algeria, which is a member of the Organization of Petroleum Exporting Countries, is targeting an increase of oil output capacity to 2 million barrels a day by 2010 and want to double proven reserves to 80 billion bbl in the next five to 10 years, he added. Amb. Boutache, in the meantime, said that France plans to provide Algeria with two billion euros to give a major boost to its economy. The financial package, to be delivered as part of a new "partnership for growth and development," will include reconverted debt, loans on favorable conditions and loans to underwrite trade, according to the Algerian envoy. "This initiative is based on the shared conviction that it's in the interest of Algeria and France to make the best use of the complementary nature of the two economies to accompany current changes in the Algerian economy and society, boost trade and multiply the shared business interests," Amb. Boutache said. He also noted that American investment in Algeria as of the end of last year totaled $3 billion.